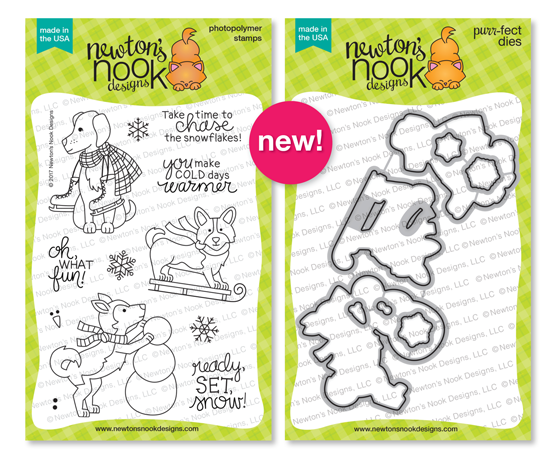 Are you ready for another Peek at the Newton's Nook November Release? We have another Super Cute set for you today.... It's called Winter Woofs and it also has a coordinating die set. This is a fun set to create a scene with... I did just that using the snowflakes as a background with some Distress Inks and the Land borders die set to create a few snowy hills. My pups are having fun playing in the snow and building a snowman. I embossed the snowflakes in White on a piece of Bristol smooth paper and then I added some Salty Ocean Distress Oxide Ink. I created two hills with the land borders die as well. I assembled the scene and stamped the sentiment in the lower corner. I stamped the images onto some additional Bristol paper and colored them in with Distress Inks. I used the coordinating dies to cut them out and adhered them to the card front with foam tape. I wanted it to look like it was snowing so I added some splatters of White paint all over the background and a little on the pups. So cute... if you have a dog lover in your life this set is perfect for them! Would you like to win the “Winter Woofs” Stamp Set? Each of these stamp sets will be given away to ONE lucky winner! Comment on the NND blog and Design Team blogs (see list below)! The winner will be chosen at random from the collective reveal posts. Make sure to check out each of their blogs and comment for your chance to win. You will not know which blog has been chosen so the more you comment on the better your chances are of winning! You have until Wednesday, November 22nd at 9pm CST to comment -- winners will be announced on the blog post on Friday, November 24th. Your background sky is gorgeous! Your dogs playing together in the snow card is so much fun! I am sitting here typing with a HUGE smile on my face loving these doggy stamps! Darling scene! Love your pretty background! OH MY GOODNESS, these are beautiful! I LOVE your watercoloring, and even the "snow" on the doggies, SO SO wonderful! Love that watercolor background with the precious images. GREAT card! Winter woofs..I love it! I definitely will need this set! Cool background! I really like the scene you created with the corgi and husky dogs (I love dogs!) Thank you for the canine-themed inspiration! Cute dogs and I like the snowflake background. Oh my goodness! 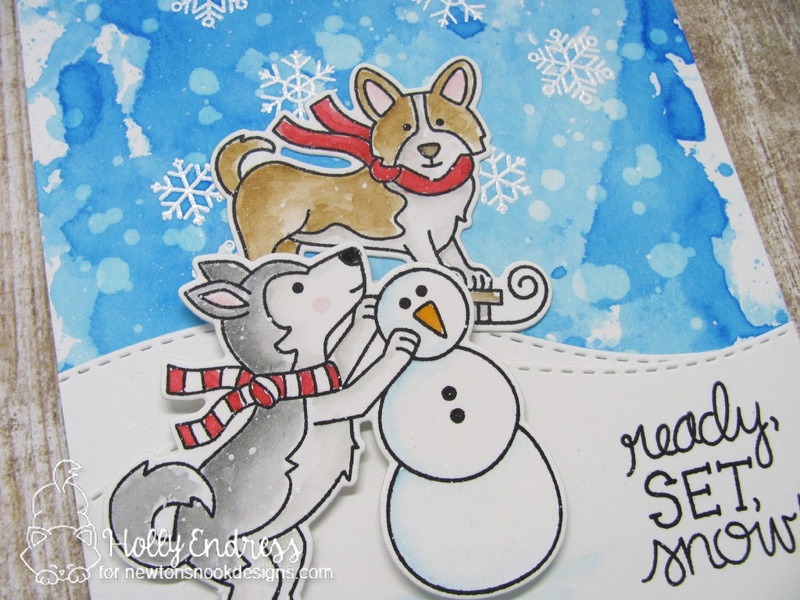 I love the snowy and super fun scene you created on your card!!! So awesome!!! Great card, loving your background! You did a sweet card ! I love your sky/background so much ! I love the blue background! Adorable card! Love those pups and your background! 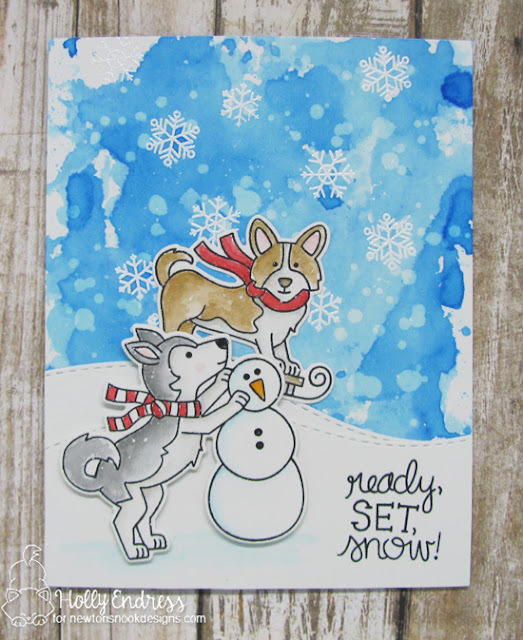 Super duper cute - love the watercolor sky and cute snowman-making husky! Fabulous card! I love the watercolour background. Wow! I love these sweet puppies!!! Your card is totally cute!!! Background is amazing!!! Such a cute winter card. Love the background. Cute cards! I love the blue background on the second one. Good idea for the background. I like the whimsy sky. This is so sweet! One of my favorites! I love the sky! Love the backgrounds on these. Adorable cards! Your design is darling and I too love the blue background. Such an adorable card. The background is lovely. Not really a dog person but these are sooooo cute! Projects are great also. These guys are my fave! Super cute!